The biggest feature for iOS 12 for most users will likely be the huge increase in performance on older devices. We tested this ourselves on a variety of devices, and saw a substantial increase in speed in many aspects -- but not all, and not on all devices. Other huge features include the focus on "digital health" and a new set of tools cumulatively known as Screen Time. We saw some big enhancements to some oft-overlooked stock apps such as Stocks, Weather, News, and Voice Memos. Apple also launched Measure, an ARKit app to measure objects in 3D space. 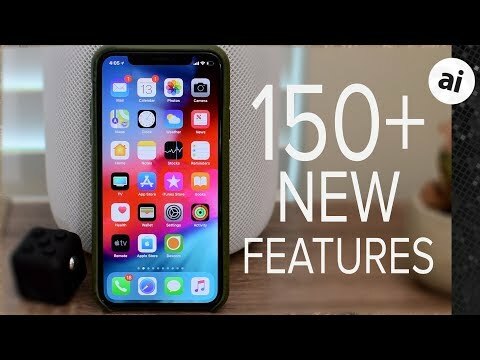 On the iPad, iOS 12 adds iPhone X-inspired gestures, grouping of notifications, support for third-party maps like Waze or Google Maps in CarPlay, new tricks for Siri with Shortcuts, Group FaceTime, and we saw ourselves in the new MeMoji. Built using ARKit, Measure allows users to measure the dimensions of real-world objects viewed through the iOS device's camera. Leveler removed from Compass app. The function has been moved to the Measure app as one of its features, and still works the same way as previous versions. Immediately shows a clear list of existing recordings when opening the app, with new recordings produced in a compact pop-up panel at the bottom of the app, complete with repositioned waveform graphic. Easier-to-view stocks on a new welcome screen, as well as interactive charts. One of a number of first-party iOS apps that have also been ported to macOS Mojave, using new tools still under development. Stocks has Apple news integration. This allows you to see news in a panel at the bottom of the app. Expanding the news panel shows stocks in a ticker at the top of the app. Three tabs at the bottom of the iPhone version including Spotlight section. Far right tab provides browsable list of followed topics and outlets. iBooks has been renamed Apple Books. A continuation of Apple's phasing out of the "i" prefix for its services. Rebranding also includes a redesign, featuring a new introduction, a Reading Now screen that's like Apple Music and the App Store in being more editorialised, and new cards for individual books. Updated Apple Books settings preferences. More options and a change of layout when looking at Books under the Settings app. Weather app air quality settings preferences. Weather app now tracks air quality. Scrolling to the bottom of the day's weather shows a general "Air Quality" category ("Good" etc) for the location. Weather app now tracks the air quality index. As with the general air quality feature, the "Air Quality Index" figure for the detected location is provided at the bottom of the day's weather report. The category placement text informed users what position in a category-based chart the app resided. This is no longer included on the page. The previous version of the App Store showed the overall app rating by users in small numbers, alongside five stars. Now, the numerical rating is more prominent. Previously all the way at the bottom of the page, the copyright details have been moved further up the listing. Apple adds new wallpaper with its major iOS releases. The top row shows water and beach-themed images, while the second shows planets. A recurring problem with the iPhone X has been the single-user limit in Face ID, since it means people can't easily share a device, as they could with Touch ID. This problem is being fixed in iOS 12 with the ability to configure an "alternate appearance," which as its name suggests may also help people who radically change their looks. Provides a lot more information about how the iOS device is being used, including which apps consume the most power. Provides details of power usage from the last 24 hours and the last 10 days, in theory showing longer-term usage trends. In the Software Update section, a new option for "Automatic Updates" can be enabled, allowing new updates to be downloaded and installed when they arrive. The new option in the Do Not Disturb menu will restrict notifications appearing on the lock screen during a predefined sleeping period. Now located alongside the Notifications, Do Not Disturb, and Screen Time sections. Now located between General and Display & Brightness. Options to update the app in the background, to use cellular data for updates, and to enable Siri & Search to access the app. Options to permanently delete memos after a period of time, to change the audio compression quality, and to set the default recording name. Enables users to set Measure's units to metric or imperial. Settings allows for users to view website and password options, enable AutoFill, change how new data is fetched, and to alter individual account settings. Prevents access to Wallet when the iPhone is locked, increasing the feature's security. Setting that can prevent anyone from accessing data over USB on the iPhone if the device is locked. Option to allow already-connected USB devices to continue working when the iOS device is locked. Option to enable or disable Siri Suggestions when the iPhone is locked. This makes it easier to perform an SOS call. The sliders throughout iOS 12 are slightly thicker compared to previous releases, making it easier to select and scroll. Playing catch-up with Android, iOS will finally "stack" notifications based on their app, topic, and/or thread. This can declutter the Notification Center while letting users manage notifications en masse. To see the contents of a stack, all that's needed is a tap. Instead of forcing users to dive into the Settings app, Instant Tuning lets people change an app's notification options from the most recent alert. Notifications can be blocked, or simply delivered directly to the Notification Center without trying to grab your attention. Silences notifications from appearing on the lock screen during a period the user sets, typically when they are sleeping. Notifications are delivered to Notification Centre but don't appear on the lock screen. Apple Maps isn't the only navigational service available to CarPlay users, who can now use alternative services from Google and others with their vehicle's infotainment unit. Normally disabled under Low Power mode, it is possible to perform the "Hey Siri" wake command when the battery is low. While not as seamless as requests for Apple Music, it will be possible for services like Spotify and others to use Siri to play media from their apps. Asking for the password for a specific application or service will open up the Settings application and show the relevant section containing passwords. Asking an iPhone's Siri where the user's iPad is located will try to find it, with options to make it play a sound, similar to Find My iPhone's options. Similar to Amazon's Alexa routines, but arguably more powerful, the Shortcuts app will let iOS users create Siri phrases that perform multiple actions simultaneously. Saying "Hey Siri, I'm headed home" could be used to start a radio station, get directions, trigger a thermostat, and send a message to your partner. You can ask Siri to turn the flashlight on and off. Siri will analyse a user's usage and habits on a deeper level, and provide more appropriate results. Used to manage the shortcuts above. Will automatically open up the Photos app to find requested memories, such as images containing specific people. Favicons are effectively icons for websites, which in other browsers are shown in each tab to make identifying individual tabs easier when many tabs are open. The addition to Safari brings it in line with other browsers. Reduces the amount of data provided to advertisers about a device, making it harder to track individual users. Can detect if the user is sticking their tongue out. Character reacts accordingly. Can detect a user winking. Character winks at the same time with the correct eye. Going a step beyond the animoji in iOS 11, iOS 12's memoji are customizable faces built by choosing skin, hair, eyes, lips, accessories, and other elements. These can match your real face or be completely outlandish, and once you're done they can be used in animations, stickers, or as real-time camera effects. Allows users to create their own Animoji character. Increased from 10 seconds previously. shows recently taken camera shots as well as those from image library in a dedicated page. Updated along the top of the keyboard. The For You tab combines Memories and Shared Album activity, and further introduces "Featured Photos" and "Effect Suggestions" in the vein of Google Photos. Upgraded search functions will let users find photos by event or place, and combine multiple keywords to be more precise. The app will also try to anticipate what you're searching for, proposing events, people, places, and relative dates before you've finished typing. Apple has made it easier to import photos and videos from pro-level cameras, particularly through native support for RAW files. These can be imported and managed on both iPhones and iPads, but only an iPad Pro can actually edit. New tools let users keep an eye on how much time they've spent on apps, and optionally set limits for themselves and/or their children. The feature also supports weekly activity reports, and regularly scheduled downtimes, which can include exceptions as needed. Certain periods can be set to limit access to specific apps, such as work-related apps when the user typically sleeps. Duration limits per day can be set for specific apps. Once a limit has been reached, iOS displays a Time Limit warning, which is bypassable and not a firm block. Used to whitelist apps that can be used all the time, regardless of other settings. Used to limit apps and content based on appropriateness, and to protect privacy. Used to restrict access to specific apps completely, or set time limits, for younger users. Fixing a long-standing issue, you can now make FaceTime audio and video calls with multiple people -- up to 32, in fact. To accommodate this Apple has switched to a "tile" metaphor, in which whoever's talking will see their image dominate the screen. Not to be outdone by Facebook or Snapchat, you can apply crazy visual effects in video chats. The most impressive are superimposed animoji or memoji, in case you find your regular face too boring. When searching for songs on Apple Music, the Music app can now find songs based on entered lyrics. Typing "kiss the sky," for example, should bring up "Purple Haze" by Jimi Hendrix. Artist profiles present larger artwork, as well as a "Play" button, which will run through every song in an artist's discography. The iOS 12 Home app includes a new section under "Add and Edit Homes" where you can configure notifications for individual accessories, organized by type. Previously people had to use 3D Touch with each separate accessory tile to find these options. Soon you'll be able to use third-party remotes with HomeKit and the Apple TV, instead of relying on buttons, switches, or (in the case of the Apple TV) the Siri Remote. Apple hasn't said exactly how this will work, but it could open up new possibilities in smarthomes. The status bar now more closely resembles the one on the iPhone X, with a conspicuous gap in the middle. It may be a strong sign that Apple expects to add an iPhone-style "notch" to future iPad models. Interestingly, iPad owners can not only see the time but the current date. Handy for those who regularly need to double-check. Swipe up from the bottom of the screen until an app zooms out, and you'll find yourself back at the home screen. Repeat this again and you'll find yourself at the home screen's first page if you were on another one. Self-explanatory -- no more quick access to media and settings controls by double-tapping the Home button. Instead, the Control Center is accessed by swiping down from the top-right corner of the screen, much like the iPhone X. Again replicating the iPhone X, iPad owners can simply swipe up from the bottom with a finger then left or right to switch back and forth between apps. Tapping and holding on the Spacebar will turn the iOS keyboard into a virtual trackpad for more precise text and object selection. Previously, Apple limited trackpad mode to devices with 3D Touch, namely recent iPhones. RAW files are the preferred format of professional photographers, since they contain unprocessed data with more flexibility in editing. More direct support should reduce dependence on third-party apps. Quick upwards swipes will kill apps, rather than needing to hold down on them. Using 3D Touch on the Camera app will bring up a new shortcut for the QR Code Camera. Using 3D Touch on Notes app brings up a shortcut to Scan Documents, which uses the device's camera. Similar functionality to 3D Touch on the Camera app, adds shortcut to open QR Code Camera mode. New links appear in Spotlight Suggestions, which can open in related apps. Now allows for the contents of apps to scroll when in Reachability mode. Chevron provides access to notifications, and for altering size of app in Reachability mode. More details provided about emails in notifications. Pop-up panel showing wide array of color options available for use in Markup. Instead of having to copy or memorize one-time passcodes sent via SMS, these will automatically appear as AutoFill suggestions in the keyboard. With a tap, the code can be entered into the appropriate field. Will warn about weak passwords and to encourage the use of stronger passwords. Warns if passwords entered for an app are in use elsewhere, minimizing reuse. Usable by developers of third-party password apps to integrate better with iOS. Can automatically pass one-time passwords into authentication text boxes in apps. Transfer passwords to other devices using AirDrop. Used to change effects of forward and back skip function timings. A swipe upward will allow for a re-attempt. Prevents attempts to take a screenshot while iPhone is waking. Screenshotting the lock screen will create usual screenshot images. New animation showing the bar moving as you increase and decrease the brightness level. Stops notifications for user-specified cards from appearing. Displays awards acquired by the user for their activities. Be on the lookout for iOS 12 to launch this fall alongside tvOS 12, macOS Mojave, and watchOS 5. Make sure to check out our other cumulative videos on everything new in macOS Mojave and in watchOS 5! And to gear up for iOS 12, Mojave and watchOS 5, find the latest deals on hardware in our Apple Price Guides, which are updated daily. Wait, what? The Leveler is insanely useful on our iPhones! Is it being put in another app or taken out completely? And if taken out completely, why would they do something like that? Just relocated to the new Measure app. Someone should count the number of times in the video he says "a little bit" "slightly" "small change". Sounds like a revolutionary upgrade here! Siri could translate before I believe, but may have learned some new languages here in iOS 12. Pretty much everything is a tweak, or a cute little stylistic bell or whistle. This should have been v11.5, not deserving of v12.0. Faster performance then what iOS and on what mobile devices? Will 12 perform faster on devices with only 1GB of RAM and A7? iPhone 5S, iPhone SE, iPhone 6/6 Plus, iPhone 6S/6S Plus, iPhone 7/7 Plus, iPhone 8/8 Plus, iPhone X,iPad mini 2, iPad mini 3, iPad mini 4, iPad Air, iPad Air 2, iPad (2017), iPad (2018), iPad Pro (9.7, 10.5, and 12.9-inch models), and the 6th generation iPod touch. So yes on 1GB of RAM and A7 since that's what the 5s has. Apple really needs to fix Siri consistency across devices. Ask HomePod what the current heat index is and Siri tells you how the Dow finished for the day. Ask Siri on your phone and it tells you what the perceived temperature is. How can these two devices not give you the same answer? And if the HomePod can’t answer something why doesn’t it offload it to your phone? How many really want to face such a learning curve every year? I am so sick of having to scroll through all this crap every other day with every Mac website and Mac blogger. Just post the link to the information Apple already provides. Are you incapable of navigating there yourself? BTW, no one is forcing you to click through and read every piece of "crap" every other day. Software show for software developers. Hardware is a different show. Soooo... are we FINALLY going to get a more intuitive way to add photos to emails? You know, like a camera icon near the keyboard like every other text input app? I gave up hope that something like that would ever come to email. Pinch and zoom the Notes app? And why is that a surprise? In the first two quarters of this fiscal, Apple sold over 129 million iPhones and 22 million iPads but just 9.2 million Macs. What do you think they're going to pay the most attention to? It doesn't necessarily make sense to release new models every year (aside from marketing) unless there's something that can be improved substantially. So maybe the Macs are going to a 15-month or 24-month cycle or maybe Apple is waiting for something from Intel. It's disappointment, not surprise, because Apple primed the rumor mill for disappointment--and they succeeded! It's not so much what new Macs could/couldn't do, it's that they would do it faster/easier.